HauntedAmericaTours.com - Information on Ghost, Haunting's and Stories of the Unexplained! This Defence is prompted by the rampant cult of personality and rampant arrogance at work in the paranormal community today. 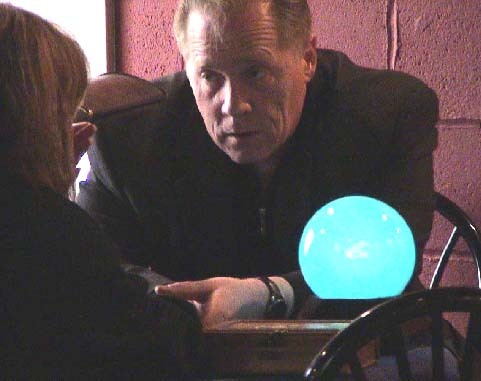 This community, which has grown exponentially in the past several years, is now populated by literally hundreds of groups and individuals who put themselves forth as professionals and experts in the field of paranormal research and the occult. And there are yet others whose focus is less on the strictly paranormal, who cloak themselves in the role of the warm-and-fuzzy, ooey-gooey spiritual "advisor" and who hold forth on a plethora of subjects from ghosts and the now-obligatory demons to what color underwear the Dahli Lama wears on a Wednesday if it's raining and the wind is from the southwest …. In fact, many of these groups and individuals are instead laboring toward one goal: Celebrity and the notoriety (not to mention money) that can come from being "just like the guys on TV." Preying upon the public's interest and often its genuine needs, these self-absorbed yahoos hold forth on websites and social networking sites with their often borrowed and mostly skewed concepts of paranormal theory and information, calling it education or, even worse, fact, modeled almost completely from what they have observed in the mass media. For its part, the media (which remember is 99% income-focused or it would not exist) has played into this dismal scenario with exploitative "reality" shows that follow the supposedly real and unscripted activities of the so-called experts and their cache of formerly idle, but now decidedly in vogue, psychics, mediums, occultists, "tech specialists," "documentarians," and on, and on. Mostly these groups will regurgitate the common, long-held conceptions about ghosts and hauntings, and equipment constructed for use in other fields of science but which have been adapted for use by self-styled "researchers" to validate suspected preternatural activity -- and they'll all look and sound very ersatz-professional doing so! But there is also, with increasing regularity, the inclusion of someone or others who present themselves as demonologists – literally an expert on demons – who are present "in case" the purported activity is "demonic" or who are there to lend other aid usually because the person being investigated thinks that he or she is the victim of demons. These demonologists always inspire a muted awe in the subjects of the investigation – after all the term "demonology" originated in the 1590's or thereabouts, must be something to it, right? The introduction of the demonologist also signals, to all those fans of paranormal reality (there's an oxymoron for us) TV shows that things are definitely ramping up – or otherwise why would a demon expert be called? There is a new trend among the multitude of ghost hunters, self-pronounced professionals, and wanna-be demonologists to use a very broad brush in painting the nature of supernatural activity when it is encountered. Only a couple of years ago, there wasn't the propensity that exists now to include demons in the laundry-list of possible spirits causing anomalous activity – unless, of course, there was some firm evidence of ritual magic or other misguided occult activities taking place in the environment (present or past) or indulged in by the individual in question that would point the possibility of genuine demonic involvement. But with the popularity of the paranormal as entertainment, all such nit-picking has gone the way of the ghosts themselves, and now anything is possible, anything is fair game. In that infamous second-to-last season-closing episode of A&E's "Paranormal State" we were subjected to Ryan Buell's fearful allusions to a powerful and frightening demonic force that he claims to have encountered in his past, with devastating results; at the same time the name BELIAL (in ominously large letters) flashes almost subliminally in between frames. So, Ryan won't utter the name, nor will he allow his team to utter the name, but we at home are responding to the schtick – and probably saying the name aloud in the cozy darkness of our living rooms. Belial, the Arch Demon, used as a prop in a fabricated fear fest designed to make teens scream in worry and woe for the "PS" hottie and the rest of us scratch our head in a collective "duh" trying to guess the identity of the bad guy. In popular shows from the old MTV "Fear" to the current "Ghost Hunters" and so many others, simply the inference or suggestion that "it's demonic" are enough to raise goosebumps – oh, and ratings, too. In "The Exorcist," what was really frightening? Was it that Linda Blair's character became possessed, or that the possessing entities were demons from the pits of Hell itself? Among investigative groups, as well, there is now a tendency to immediately bring the possibility of the demonic into play – as if the obsession or possession by evil discarnate human beings isn't frightening enough! Appealing to our deep, primordial fears and also to our propensity for "rubber necking" at everything from car crashes to murder scenes, the demonic is the new and exciting spirit du jour! This casual approach to demons and the demonic realm is worrisome to me for several reasons. The first is that it deliberately increases the fear of both victims of supernatural occurrences and the public in general with regard to the nature of what is being experienced; inferring that the experience is "demonic" automatically creates undue fear and worry. Second, jumping to the demonic can often turn the spotlight away from what really is happening and what type of spiritual activity may actually be taking place; there is a large catalog of verifiable activities perpetrated by all sorts of spirits, not necessarily demonic. And finally, it both minimizes the profound reality of Demons and produces a more casual attitude toward the demonic that not only denigrates the profoundly cosmic nature of these beings, but also opens the unwary and the just plain stupid up to a vast array of undreamt-of horrors. Folklorist and occultist Alyne Pustanio is a New Orleans whose roots go deep into the local culture; it is from that proverbial “gumbo” that she draws her inspiration for most of her tales of terror and fascination. A descendant of Portuguese and Sicilian immigrant families who trace their ancestry to European Gypsies, Alyne was exposed to the mysteries of the occult at an early age. Two great-grandmothers were gifted and sought out mediums and another relative is a verified psychic, however, Alyne credits her mother – an avid spiritualist – with inspiring her lifelong interest in the supernatural and unexplained. When still a schoolgirl, Alyne accompanied her mother to spiritualist meetings and panels where she met some of the early paranormal greats such as Hans Holzer, Ed and Lorraine Warren, and Jeanne Dixon. First-hand experiences with the world of the unseen (she has lived in haunted houses and around haunted people all her life) and her own intuitive nature caused her fascination with the paranormal to grow, and for more than half her life she has been a student of the occult. These interests, combined with her avocations in folklore and history, result in a validity and passion that is immediately obvious in all her writings. Some of her most colorful pieces, “The Zombie Child of New Orleans” among them, owe much to the rich supernatural heritage that steeps New Orleans; others, such as her essay on “Psychic Vampires” published in Doorways Magazine, are the product of harrowing real-life experiences. Essays such as her “Defense of Demons” are breaking new ground in the realm of paranormal investigation, changing pre-set notions and concepts about the real dangers of the supernatural realm. Alyne has used her extensive knowledge of the occult, in particular the traditions of Western Ritual Magic, in her work as an Occult Analyst and Case Manager for groups such as Louisiana State Paranormal Research (LSPR) Society, Seekers of Unexplained Louisiana (SOUL), and New Orleans Paranormal and Occult Research Society (NOPORS). She is also frequently called upon by individuals across the United States, victims of attacks from the realm of the unseen, for information and guidance in cases of extreme hauntings or suspected demonic activity. In addition, Alyne coordinates the Paranormal and Unexplained track for Babel Con, a popular multi-genre convention held annually in Baton Rouge, LA; she also lectures on the paranormal and occult at Babel Con and other conventions in the South. When she is not writing, developing material, or investigating, Alyne enjoys participating in Renaissance festivals and medieval faires throughout the South; she is the founder of her own tribe of Gypsies, “The Vitsa Hokano Baro,” which she describes as her own “living experiential discovery” of her Gyspy heritage. A November child,she loves dark, brooding, grey days, cold weather and thunderstorms; anything to do with the British Isles, the American Civil War and New York City; reads the works of Samuel Taylor Coleridge, Edgar Allan Poe, Christina Rosetti, and Tolkien, admires Milton, Blake and Machiavelli, and is a student of modern occult writers John Michael Greer, Michael Ford, and Dr. Joseph Liewsienski. Her favorite holiday is Halloween, her favorite color is black and she lives in New Orleans with her teenage daughter, two dogs and several cats. The San Francisco Ghost Society was founded by Tommy Netzband as a small all volunteer organization, devoted to the research and investigation of the city and county of San Francisco's ghosts and paranormal occurrences. We conduct FREE, professional and discreet investigations of locations where there have been reports of paranormal activity or unexplained occurrences. Our approach is one of flexible skepticism; we seek to remain unconvinced by the end of the investigation, as opposed to embracing every speck of dust caught on camera as proof positive of a haunting. To this end we conduct extensive research about a prospective site, to understand its history, architecture, infrastructure and location. We utilize a broad spectrum of equipment and technology to record and analyze the course of the investigation. Our team members are all responsible, knowledgeable and professional individuals from the San Francisco area, who contribute their diverse interests, talents and time to each investigation. sfghostsociety@yahoo.com or call us direct at: (415) 336-6945. You can see how many different people have many different answers you can also check out how they feel about other Paranormal issues and their beliefs Please Visit here. HAUNTED AMERICA'S PARANORMAL ZONE. Each week Haunted America Tours turn on the Ghostly Spotlight on some of your favorite Paranormal Experts, Ghost Writers, Paranormal Investigators and Ghost Tours from Across America. Who will be the next Haunted Paranormal network star? Ghost hunting can be an expensive or inexpensive endeavor (yep, inexpensive). It all depends how much you want to spend. Investigators have shown significant results with equipment which is very affordable, so don't let pricing discourage you. Truth be told, you can document and detect ghosts and spirits with a variety of items. Of course the more you have the better, but everyone needs to start somewhere. SOME OF THESE HAUNTED GHOST FILLED VIDEOS ARE JUST FUN TO WATCH, OTHERS MIGHT MAKE YOU THINK TWICE ABOUT WHAT IS REAL AND WHAT IS NOT ! WE DO SO HOPE YOU ENJOY THESE GOOGLE, AND YOUTUBE VIDEOS WHICH WERE SENT TO US BY OUR MANY WEB SITE VISITORS. How can you say ghost exist unless you try to experience it yourself? If you are not willing to try, then you have no factual basis for your conclusion. To put this another way, don't decide it before you try it. All beliefs come from a experience. Many believe people for their word, others not so trusting simply need to be shown. And still more do not believe what they see even if it shoved in their face. Are you the real victim of a ghost bullying you? Aleister Crowley "The Wickedest Man In the World." SALEM WITCHES: GHOST PHOTOS ... REAL GHOSTS! U.S. Route 666: Known as The Devils' Road ... Traveling along the Highway to Hell! Cryptids, we have come to know and love! Well, instead of a two car garage... we have ghosts! Real Stigmatized Property? What's anomalously hot and what's paranormally not! See what upcoming haunted events are happening across the America! SHOP HERE FOR STRANGE THINGS THAT WILL BUMP IN THE NIGHT!